Check Out the Updates and Photos Of the Create Here Now project. Each Class just $40 sign up for all and get one for Free!!!! 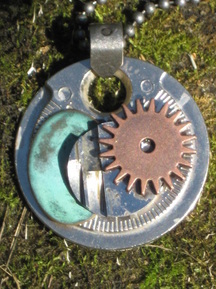 Work with Tools and materials and create a funky pair of earrings. 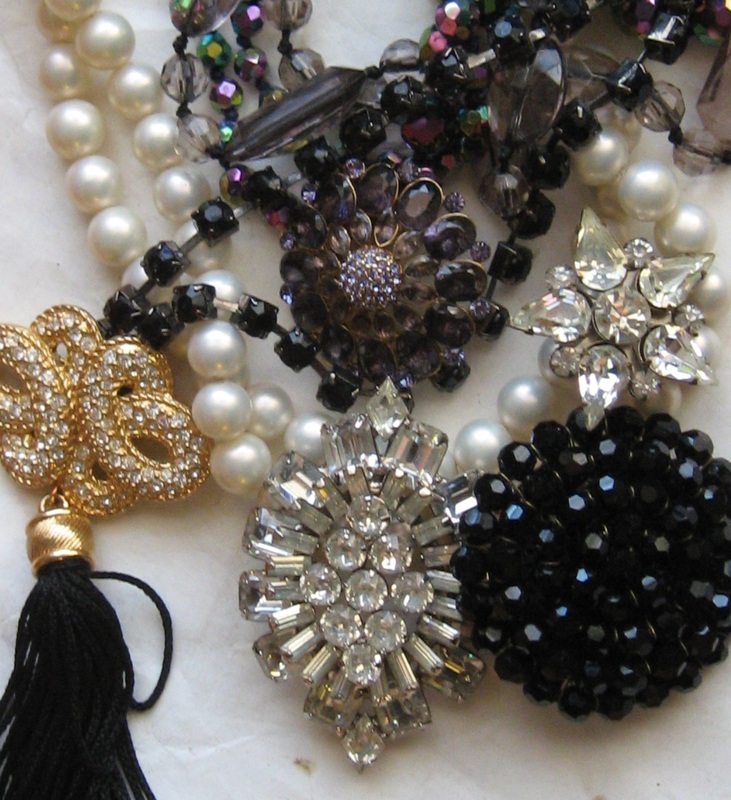 Create jewelry and learn about style, textures, color and materials. Create jewelry from paper, cardboard paper arts and fashion. Classes begin promptly at 6pm. Re Made In Bridgeport: A Creative ReUse Challenge and Community Project. The Bpt Art Trail !!! This is a City Wide event, where community and art lovers join together and visit all the various locations throughout the City. Bridgeport's Many Artists get to shine and show their stuff, perform, recite and create for a massive audience for 4 special days each year in November. In it's 8th season, The Bpt Art Trail kicks off with an Artist party on November 10th at the City Lights Gallery's new location. Suzanne Kachmar is the leader and organizer of this great undertaking, along with the help of supporters, sponsors, and liasons from the major Art factories throughout the City of Bridgeport, with more than 34 locations throughout the City it's a very big "Plus" for Bridgeport. Each location has something special planned for the event. People get to see, buy and experience art from some of our top notch artists. Here's where my ReMade In Bridgeport comes in to play, remember I mentioned timing. My location on the Bpt Art Trail is at the Bridgeport Innovation Center (BIC) on Bridgeport's East End. I moved back to my old digs here last year and have created quite a studio for myself. This year I decided this would be the opportunity to make this idea happen. But on a larger community based level. I have spent weeks accumulating objects, scraps, recyclables and my neighbor at BIC, Bill Wales donated the boxes, I designed and created labels and then the fun begins. Each box contains miscellaneous materials for creating art. No one knows what is in the box ..Remember the days of Grab bags?? You Never Know What You Are Going to Get. Appropriate For ages 5 and up, Adults welcome and it is a great project to do as a family. Create sculpture. wall art, mobiles and more...wherever your imagination takes you. The Boxes can be picked up with a suggested donation of $10. (Please pay more if you like or whatever you can).NOTE: I am Looking for Sponsors to assist in this endeavor so if you have a big heart and Deep Pockets for the Arts lets get in touch. Locations for pick up will be at the Made In Bridgeport Booth at The Black Rock Farmers Market, Downtown Bpt Farmers Market and at City Lights Gallery. Then on November 12th and 13th your art pieces will be on exhibit and you and everyone we know will join in the celebration at the Bridgeport Innovation Center 955 Connecticut Avenue. There will be a reception, awards and a community recycling art project on a grand scale. Everyone is invited!!! So Tell Your Friends.gn up and pay for classes up front and get one class for free. Please sign up for any or all workshops at madeinbridgeport@gmail.com so that we may know how to prepare and know how many to expect Thank You. The Key to Beating the Winter Blues. Come share your ideas, find support for your projects, be uplifted and inspired. Bring food to share and a donation is welcomed.???? PLEASE CONTACT US WITH QUESTIONS OR RSVP TO HOLD YOUR PLACE FOR THE WORKSHOPS LISTED. WE CANCEL WORKSHOPS DUE TO BAD WEATHER, Or LACK OF ENROLLMENT. WORKSHOPS AND CLASSES ARE LIMITED TO 8- PARTICIPANTS. WE APPRECIATE YOUR ATTENTION TO THIS MATTER. This Months Featured artist is Karen Booth a member of the Bridgeport Artisan Community at Made In Bridgeport. Karen's work is unique and beautiful as she recycles and repurposes common paper packaging and natural objects found in her travels at local beaches and parks into beautiful handbags, great jewelry and accessories and fun playful clothing for adults as well as doll clothing and accessories for Barbie- like Dolls (14- 1/2 inch size). Karen Will be Facilitating a Kids workshop for promising fashion designers Her workshop will teach young fashionistas how to create a party dress for her favorite doll from recycled paper. Fee is $10/ Ask us about Family rates. Reservations are required as we imagine this will fill up very quickly. performance work of art that has evolved into an effective communication, educational and training tool which utilizes the power of imaginative play to facilitate the Creative Process. Schedule a workshop for your school, staff development, corporate team building. 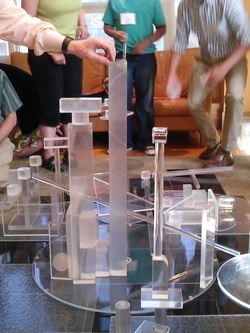 Check out images below from a workshop conducted at The Graustein Foundation. Make it a Ladies DAY Out for You and Your Friends!!! The Workshop You have all Been waiting for!!!! No This is not a Weight Loss Workshop, Its a great opportunity to get rid of the stuff you have been holding onto and create something new. Bring some of your junk- the junk from your recycling bin- your jewelry box, yep even that orphaned earring and lets get this Party Started. What is Bring the Junk from Your Trunk? I am a mixed media artist so I carry a funky tool box and I have trays of common and uncommon and mostly unusual objects and spread them out onto the trays into categories of bases, main subject, accomplices and stringing it all together. I really like to play with the pieces and encourage customers to play as well. 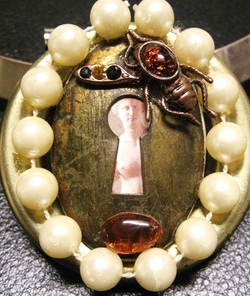 My jewelry workshops and working with found and unusual objects are a way to get customers to create a story out of the objects and play around with the pieces to see what they come up with. I love the stories they tell as well as the connecting of imaginations for those who think they may not have a creative bone in their bodies…Often they are really surprised. Most customers bring in their own unusual, personal items and we create something they will cherish. We design either one on one as a private consultation or as a group- private or by activities already on our calendar. And I also create Custom orders. 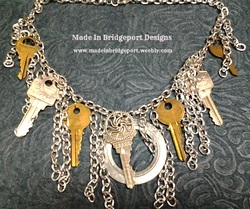 You can also buy a custom gift for a friend with Made In Bridgeport . Altars and Shrines : A Workshop for Self- Discovery. This workshop will explore and begin the process of storytelling using small boxes to create personal shrines. These are more portable and can go with you wherever you may need them. We will use various types of collage materials, a mixed media of textures, colors and objects that evoke symbols and meaning. Some materials will be provided, but, some should come from your own special mementos and treasures. (Please only use photocopies of special photos and make a few in various sizes). We will focus on subject, themes, materials, inspiration and possibilities in a group setting. Materials you might bring- Bring a snack as well. Its everywhere -use it if it means something to you. Beads/ Baubles broken jewelry, chain, etc. Paints, Pens, Markers. Anything and Everything that Fuels Your Imagination!!! One on One Private Consultations Schedule yours today.